FILE - A U.S. Army recruit is instructed by a drill sergeant, right, during live-fire marksmanship training at Fort Jackson, S.C., Aug. 17, 2016. Two-thirds of immigrants recruited by the military under a program targeting medical specialists and language specialists pass their security screening and go on to serve in the U.S. armed forces, according to the Pentagon. "Two of three MAVNI applicants, on average, make it through," Pentagon spokesman Air Force Major Carla Gleason told VOA on Wednesday, using an acronym for the Military Accessions Vital to the National Interest program. This acceptance rate does not include the hundreds of immigrants still waiting to pass their security clearances. The 2-to-1 ratio of accepted MAVNI recruits is about the same as that of American recruits who go on to serve in the military, Gleason added Thursday. In fact, just 29 percent of Americans ages 17 to 24 meet the standards to join the military without a waiver, said Pentagon spokeswoman Jessica Maxwell. 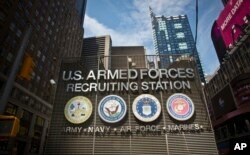 FILE - The Times Square military recruiting station displays insignia for each military branch in New York, July 15, 2015. MAVNI came under additional scrutiny after The Associated Press reported last week that more than 40 immigrants recruited under the program had been "abruptly discharged" from the Army. In response to the AP report, the Pentagon said "there is no new policy" concerning immigrants who wish to join the U.S. military, with the Army adding that "any recruit … who receives an unfavorable security screening is deemed unsuitable for military service and is administratively discharged." The MAVNI program ended in September 2017. However, hundreds of MAVNI recruits who were still in the process of joining the military at that time were to be "grandfathered in" if they passed appropriate security checks, according to Gleason. A U.S. defense official told VOA and other reporters that the hundreds constituting this final group of MAVNI recruits most likely could include those with backgrounds that are more difficult to clear through security.